I read in the paper the other day that 50% of US counties are currently experiencing drought conditions. That’s some hot, dry weather, folks. I think we all need to do a collective rain dance to give these parched lands a break. We’re doing okay in my neck of the woods. After the devastating fires in June, the July and August afternoon rain showers arrived, just in time. It’s still incredibly hot during the day, but by 4 or 5 in the afternoon, the clouds and rain rumble in (lightning too, which I’m not as excited about). The showers don’t last long, but boy, are they ferocious. This is good news for us but not so terrific for the folks in the fire zones. Can you say “mudslide?” As if those people haven’t suffered enough. Maybe we need to do a collective Gentle Rain Dance just for them. Gentle rain, Mother Nature. Got that? It’s still too hot to do much cooking inside, but we’re getting a little weary of sandwiches here at Chez T. Even my summertime crack sandwich is getting a wee bit tiresome, and that’s something I thought I’d never say. This salad is the perfect antidote to steamy days. Chock full of refreshing herbs and crunchy vegetables, it’s got some serious cool factor going on. But just to keep things interesting, the addition of chiles and fire-grilled steak take this salad to a crazy-good level. I think that’s why I love Thai and Vietnamese cuisine so much–who can resist such complexity and contrast? Cool veggies/hot chiles. 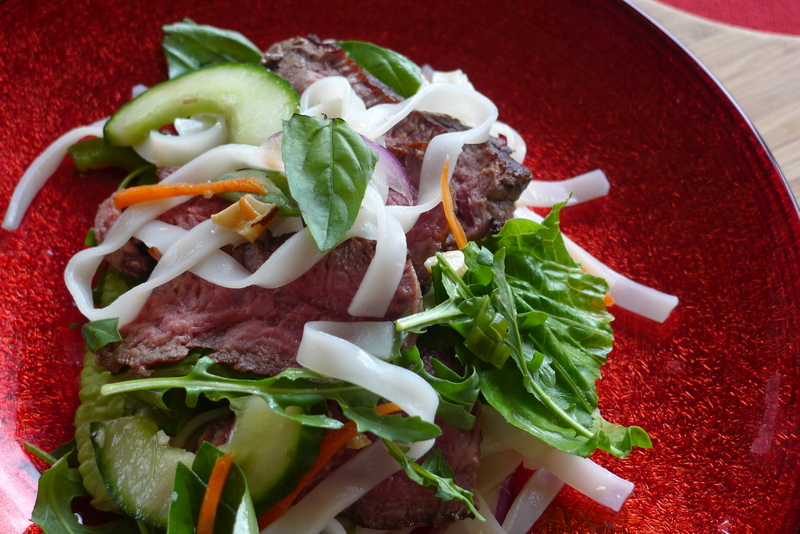 Silky rice noodles/charred steak. Sweet/sour. Salty/hot. Oh, how I love that marriage, quirky as it is. When it’s truly blazing outside, I crave ethnic food like nobody’s business. I’ll save American staples for fall, when the air turns crisp and the idea of pot roast or a smothered pork chop seems like just the thing. Until then, I’ll be slathering on deodorant and stocking my refrigerator with chiles, lime and herbs. The girls start school in less than two weeks, and I can’t quite wrap my head around that. It’s still 90-degree weather! That’s swimming hole weather, not book-bag weather, right? Despite my protests, the school year is coming for us, ready or not. I think maybe I’ll stay in denial for at least another week. Summer, you’ve been a brutal bedfellow, but I’m not ready to let you go just yet. Combine first 6 ingredients in a mini food processor or blender; whirr until combined. Put the mixture into a zip-top plastic bag, add steak and refrigerate 1-2 hours, turning occasionally. In a medium bowl, combine carrot, sugar, lime juice binegar, fish sauce, garlic and chile. Stir until sugar dissolves and let sit about 10 minutes. Cook noodles according to package directions. Drain and rinse under cold water. Set aside. Preheat grill to high heat. Remove steak from marinade and grill, with the lid closed as much as possible, until cooked to desired doneness; about 7-8 minutes total for medium rare, turning once. Remove steak from grill; cover and let rest for 10 minutes. 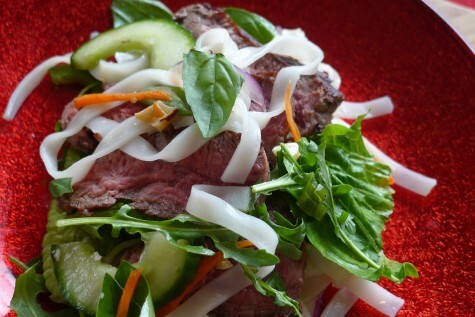 While steak is resting, combine the lettuce, herbs, cucumber bean sprouts and chile, if using. Add carrot mixture. Toss gently. Add rice noodles; toss. Slice steak thinly. Place on top of salad and sprinkle chopped peanuts over. That recipe looks too good! We might try next week after our 12 year old picky eater guest heads home. I have new respect for those of you who love and live with picky eaters. I received a school packet last week that mentioned the C word. The 7 letter C word as in College (silly girl)….I guess, parents of soon to be 11 graders are suppose to consider the fact that their kid may want to go to college. I tossed the packet under my bed and screamed NO. School should start after Labor Day and end the Friday after Memorial Day—When I’m Queen I will make it so! College? Eeek! I’m having enough trouble facing first grade! I had very similar at our local Thai place this evening. A beef salad very much like you describe and it was fabulous. I think the Steak would be better than the generic beef that they used but all in all it was great. Love the mint, I will definately try this. You’ll miss that heat once it is gone. I don’t do beef, but I did make the summertime crack sandwich (added some LSD by way of avocado) and toasted the bread. Goodness. @Katybeth — I literally just burst out laughing at you tossing the packet under the bed. It’s hot; get it away! As a vegetarian am I allowed to say how freaking delicious that steak looks?? I cook my SIL’s lunches – my husband wouldn’t touch this salad with a 10 foot pole, but this is going on our menu next week! I’m there with you slathering that deodorant like nobody’s business. Oh autumn please tell me you are on your way! In the meantime this salad looks sensational with its splashy refreshing flavors. The best part is that you can eat it cold. Lovely salad, Kitch. We’re used to the heat in S. Florida….and pretty much live with air conditioning but that doesn’t mean we don’t all turn to salads whenever we can. Please tell me that your husband isn’t cheap like mine and sneakily turn off the air conditioner whenever he can. I’m ready to throttle that man! School weather . . . I can’t wait. That first crisp morning, I’ll be celebrating in the streets. I’m gagging just a bit over here with all of the different textures in this salad. It sounds yummy, kind of… I’m (sadly) a simple palate kind of girl… We’ve been doing our share of fajitas over here as the grill can take on the meat and the veggies. Thankfully the cooler weather has arrived just in time for school to begin.